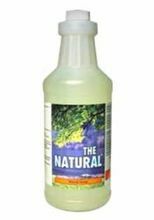 The Natural Hand Soap is made in a base of Aloe Vera and leaves skin feeling clean, soft and silky while helping prevent dry skin. Wet skin and apply soap. Lather and rinse with water. Repeat if desired. Dry hands with a soft, cotton towel to prevent chaffing. Amine Oxide (from coconut oil and/or palm kernel oil), Potassium Chloride (naturally occurring mineral), Anionic Surfactant (derived by sulfonation of coconut oils and lauric), Citric Acid (from fermented corn), Amphoteric Surfactant (from coconut oil and/or palm kernel oil), Ozone Treated Water (for purification), Non-Ionic Surfactant (naturally derived detergent in an ethanol derivative), Aloe Vera (extract from aloe vera plant), Green Apple Extract (from apple peels and seeds). Contains no preservatives. All ingredients are biodegradable or break down into harmless natural elements. Contains no Petroleum Distillates, EDTA, NTA, Ammonia, Benzene, Grain Proteins, Enzymes or Formaldehyde. Free of all known or suspected carcinogens. Gray water and septic tank safe. Biodegradable without effluent treatment processes. Has not been tested on animals. This product may cause eye irritation. In case of contact, flush with water.